The School of Ayurveda, Gampaha, was a dream came true on July 19, 1929. The Ayurveda School was originally named Gampaha Siddhayurveda Vidyalaya. In 1982 the name was changed to Gampaha Wickramarachchi Ayurveda Institute when it was registered with the Government. This year 2009 it completes 80 years of yeoman service to the nation. It was in an era when there was no such institution in the island, that young Panditha Gabriel Perera Wickramarachchi had pioneered this adventurous project. The State managed College of Ayurveda Rajagiriya came into existence later. Panditha Wickramarachchi returned from India in 1921 after his LAMS (Hons) degree from the prestigious Jamini Bhushana Ashtanga Ayurveda Institution, Calcutta and joined his father, who was a prominent Ayurveda Physician and worked for a short period. Thereafter he started a dispensary of his own in Gampaha. Yet his aspirations were far beyond than being only a Physician. He had developed a great desire to set up a School of Ayurveda in Sri Lanka for students with talent and passion for Ayurveda. This idea of a School of Ayurveda did not receive the expected support of the elders. Yet he ventured on his own and initially purchased a block of land in a scenic setting at Yakkala. The school came up as a complete complex, with a dispensary, and laboratories for the preparation of oral medicines and external applications. The need of the hostel facilities for students from distant rural areas was also met. A row of rooms with basic amenities and a kitchen was also included. It is likely that the idea of starting a School of Ayurveda in Sri Lanka has arisen on his seeing numerous such institutions in India. His personal experience during his studentship in Calcutta and living in hostels, provided by the institutions, to suit the simple living standards of the Indian students, probably formed the roots of his noble thought. The School of Ayurveda at Gampaha was entirely a private institution owned and funded by Panditha Wickramarachchi. He personally taught the students assisted by other lecturers as and when required. No fees charged from the students even for lodging. The practice of free education was really originated in 1929, long before the State conceived of free education in schools. Panditha Wickramarachchi had set up the School of Ayurveda, Gampaha and also given free training to the students, not in anticipation of any honour. He had done it entirely to satisfy his vision, to see this country resorts to Ayurveda form of medication as in the ancient past. He expected it to be so at least in the distant rural areas of this Land. The training and experience imparted to the students were not merely for them to function only as Physicians. They were given the know-how to run a laboratory, to manufacture quality oral medicines and external applications and supply them to the patients on payment of a nominal fee. The compound of the school at Gampaha was full of medicinal plants and herbs so that the students could identify them at sight and also know the technique of growing them, in their lands. Panditha Wickramarachchi by habit every morning spends time in the garden of plants and herbs talking to the students of the uses of various plants and herbs and also gives hints on how to nurse them for healthy growth. He expected his students in the course of time to carry out research and to shine better than him. That was the motive of this great, noble, selfless visionary. From the inception of the Ayurvedic School in 1929 to 1966 the institute was entirely maintained by Panditha Wickramarachchi. Thereafter, in keeping with the Ayurveda Act No. 31 of 1961 the State was required to give recognition to and assistance for the development of Ayurveda studies. In this set up the Gampaha Wickramarachchi Ayurveda Institution was given a Government Grant in 1966. At the same time in recognition of the services of Panditha Wickramarachchi, his son, Winaya-kantha Wickramarachchi was nominated as a member of the Board of Management which was formed as required by the regulations. Winaya-kantha Wickramarachchi in addition to being a member of the Board of Management he functioned as Treasurer for 17 years from 1966, until the Ayurveda Teaching School was taken over by an Act of Parliament and transformed to a semi State Institution in 1982. This occurred 7 years after the death of Panditha Wickramarachchi. Subsequently the Government considered it necessary to award an Ayurveda Degree (DSAMS) to those who follow the five year course at the Ayurvedic Institute. To meet this requirement the Government upgraded the Institute to University status in 1988 November. The affiliation of it to the Kelaniya Campus took place in 1995, by Act No. 1 of Parliament in 1995. Apart from the Gampaha Wickramarachchi Ayurveda Institute at Yakkala, the manufacture and supply of medicinal products is done yet in another separate complex. It is owned and managed by Ms. Anusha Wickramarachchi who is the daughter of Winaya-kantha Wickramarachchi. Though Panditha Wickramarachchi is not among the living his son and granddaughter are actively holding on to family traditions to keep the name Panditha Wickramarachchi alive very much like the statue that stands in the premises of the Ayurveda Teaching Institute at Yakkala. The State had recognized the magnanimity of Panditha Wickramarachchi in donating to the State the entire Ayurveda Teaching Complex at Yakkala and also his selfless service to the Nation as a teacher in the Institute. 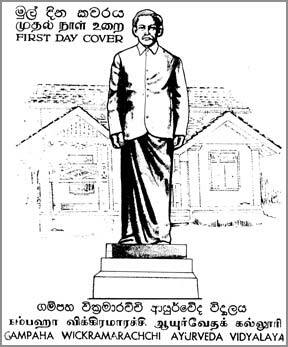 After the demise of Panditha Wickramarachchi in 1975 it was considered necessary as a tribute to this great personality, to perpetuate the name Wickramarachchi. This was achieved by renaming the school as Gampaha Wickramarachchi Ayurveda Institute in 1982. To commemorate the 60th year of the Teaching School and to honour Panditha Wickramarachchi a postal stamp valued at 75 cents was issued on the December 14, 1989. Even far back in 1957 February he was nominated to the Senate from where he resigned after some time and again got elected to the Senate in 1961 by the then Prime Minister Hon. Sirimavo Bandaranaike. The Vidyodaya Pirivena also in appreciation of the services of Panditha Wickramarachchi conferred on him the title of Ayurveda Chakravarthi. When you look back at the activities of Ayurveda Chakravarthi Panditha G.P. Wickramarachchi, not only the personal wealth he spent on the school project but imparting to students his knowledge and experience which are priceless, he was not only a philanthropist but a teacher incomparable amongst human beings. Such individuals are seldom found on earth. We can well believe that Ayurveda Chakravarthi Panditha G.P. Wickramarachchi has taken birth in a Brahma loka and will attain Nibbana in the course of time. It has to be so. G.P. Dhanatunga Senior Old Anandian.